Free Shipping Included! WALKAROO XTREME Steel Balance Stilts with Height Adjustable Vert Lifters by Air Kicks by Geospace at Scruffs Game. MPN: FBA_11111. Hurry! Limited time offer. Offer valid only while supplies last. WALKAROO XTREME Balance Stilts for advance stilt walking quickly adjust to accommodate anyone from 4 ft, 6 in. to 6 ft, 6 in. (ages 6 and above). WALKAROO XTREME Balance Stilts for advance stilt walking quickly adjust to accommodate anyone from 4 ft, 6 in. to 6 ft, 6 in. (ages 6 and above). What makes them so "Xtreme?" It's the adjustable walking height that takes you from the height of Original Walkaroo Stilts (5" off the ground), WAY UP when you attach the included VERT LIFTERSTM. These Extensions allow experienced stilt walkers to walk even higher - they can be adjusted from 12" to 17" off the ground! 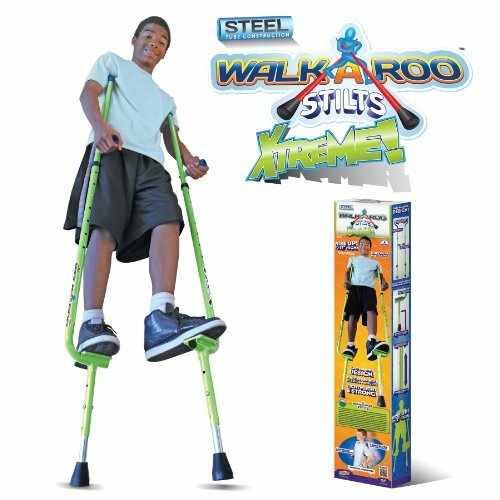 Walkaroo Xtreme Stilts are made of rugged tubular steel for use indoors and out. Maximum rider weight is 210 lbs. Ages 6 & Up. Minimum height: 4' tall (48 inches, or 122 cm in height). Maximum user height: 6' 6" tall (78 inches, or 198 cm in height). Package Dimensions: 37.5" x 7.75" x 3.5"
Suitable for advanced stilt-walkers aged 6 years and up to 210 Lbs. Go to the XTREME with a height off the ground that ranges from 12 to 17 inches (30.5 cm to 43.2 cm) with Vert Lifters. Constructed of rugged tubular steel with non-marking feet for use indoors and out. Large rubber foot on the bottom of each stilt for maximum stability. Ergonomic "S" bend in the upper portion make the poles rest comfortably behind your shoulders for hours of fun.